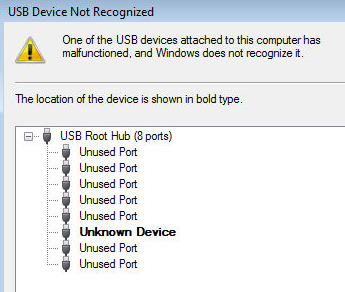 How to solve "USB device not recognized" problem in Microsoft Windows? The original post is from OnlineTechTips. Credit for them. Hope this helps someone fix that pesky “USB device not recognized” Windows error! So there you go, unplug your pc from the power point and see if the problem solved. This solution has helped many happy users to solve their problem, hope it helps you too! Previous PostClean Up Your PC Safely with Hard Drive PowerWashNext PostHow to solve Windows 7 ‘Devices and Printers’ forever loading and blank? To whom posted the solution how to solve device nor recognized. I’ve tried this and almost every other thing I could possibly think of. I have a USB device that is made to plug in a PS2/PSOne controller to your PC. This device has been working for several years and when I installed windows 7 the first time it was a lil problem to get it working but it did. Then all of a sudden one day I had had it unplugged for a week or so and when I pluged it in I got the message “USB Device Not Recognized”. Problem is that for the device to work it needs to be recognized as a HID Compliant Device but it simply refuses. I’ve tried every ordinary step to have it up and running but when I get to the final steps it always comes back to “Unknown Device”(USB). If you really did everything that I posted, including the alternative solution one, I would suggest you to try your PlayStation controller converter in other computer. This is able to try out whether is it the converter itself having problem. And also if the USB ports that you tried on with your converter are workable with other devices, most likely your converter is spoiled (not 100% sure though, hardware is non-predictable). Hope you able to find out the root of cause! You’re a life-saver, man! I was almost going out of my mind. I began to have the situation this morning (Sunday Nov 22). I tried everything I know and others I read online, yet, nothing. I use a hp dv4 Pavillion, so, the problem also affected the finger-print reader apart from the USB ports/devices. Thank you for that very important piece of information. I sincerely, truly do appreciate. Thanks! If the problem lies on the USB device, obviously my stated solutions will not work for you. It’s only used to solve Windows conflict with USB ports. Sorry that I can’t help you much. Fixed an annoying and very perplexing problem…thanks so much! This is vishal overhere. actually i went through your article about UNPLUG YOUR COMPUTER FROM THE POWER SUPPLY then try it……………..
but still i am not able to connect my ipod with my computer…………..i have ipod classic80gb……….. so dear can u please tell me some other way….. This works for me, as it did for most people. But my laptop goes back to giving me the same ‘not recognized’ message on the next boot. So then I have to power down, unplug, wait, power on, reset time & date, before I can use my flash drives. It seems that the ‘fix’ is only good for one boot. Is there any way to fix this dreadful problem in a more permanent way? I am not sure but it is possible that your USB ports have physical damage, or the power management of the USB isn’t set correctly. I would suggest you have your laptop checked by the manufacturer to find whether there is problems with your USB ports. I have windows 7, and unplugging my power supply and restarting did nothing. As the message shown, you have to connect your digital camera to the other favored hub (from what I read from the message). Can you try connect your digital camera to other USB port when this message appear? pls help me mr.ghost301 i have my all files on my usb and my thesis save on my usb drive!!!! I am sorry to hear that. If you tried your USB drive to the other computer but still remain the same problem, most probably your flash drive is broken. Probably you can look for the shop that provides data recovery from your USD flash drive, if it is really necessary. ok tnx sir i open it its broken hmmf after i goto shop to repare it can i retrive my files and can i use again my flash drive sir!! . . .how can i fix f my usb is problem looks like in the image on the top of the unknown device how can i fix it sir!!! thanks for ur help BUT the problem in my External HDD when I plug in to any PC or laptop it give me same error USB device not recognized !! by ur step I fixed it and working back but the problem I should to do this every time I need to open it?!?!! it very hard and not make sense please any help ?? I suppose this issue won’t always happen, but if it does, I am afraid you have to do that every time. Is it possible that your external HDD already having some issue? Just guessing. If the problem still persists, I think it would be either the USB device is already malfunctioned or the USB port of your motherboard is already malfunctioned.